NCLEX exam success and getting a registered nursing career you can be proud of begins with understanding basic facts of your nursing test. That is, how to register, the format and categories of this test. In this way your test preparation and test taking experience will be much easier and more successful. You can avoid common NCLEX-RN review frustrations and wasting precious time. The biggest waste of time after weeks/months of taking NCLEX practice questions and reviewing your study guides is getting a failing score. Then having to start all over again from scratch. Therefore, the purpose of the information below is for you to pass on the first try. The National Council Licensure Examination For Registered Nurses® (NCLEX-RN®) exam is developed and administered by the National Council Of State Boards of Nursing® (NCSBN®). It’s purpose is to ensure that each entry level nurse has the knowledge needed to perform in a safe and effective manner. The NCLEX exam is administered across fifty states, four U.S. territories and the District of Columbia. In order to register for this assessment, a registered nursing candidate should apply to the National Council of State Boards of Nursing for licensure eligibility. Once your eligibility has been confirmed the board will provide an Authorization to Test (ATT) number. At the same time the candidate should register with Pearson VUE, the contracted test provider. There are three ways to register with Pearson VUE: online, by telephone, or by mail. The cost of the exam is $200 and can be paid using a credit or debit card (VISA, MasterCard, or American Express). It is also possible to pay using a money order, cashier’s check, or certified check. NCLEX test centers are available throughout the United States and can be scheduled through Pearson Vue. Upon arrival at the testing center, you’ll be asked for your ATT number and valid identification. It’s important to arrive on time, if you are more than 30 minutes late you may have to forfeit your examination. Paper or writing instruments are not permitted in the test center however an on screen calculator and notepad are provided. Prepare for your NCLEX RN exam with a clear understanding of the purpose of this assessment. It is determine how well a registered nurse candidate can use their critical thinking skills when making professional judgments in real life nurse practice. Don’t just memorize in the course of your RN review sessions. You must be able to apply the knowledge you learned in 4 years of college to scenarios a professional registered nurse will likely face. Before signing-up for any NCLEX exam review class, make sure it covers the four major categories which are The Safe and Effective Care Environment, Health Promotion and Maintenance, Psychosocial Integrity, and Physiological Integrity. The categories are meant to encompass patient needs throughout a human life span. The Safe and Effective Care Environment section represents 17-23 percent of the NCLEX-RN exam. It includes both Management and Care, Safety and Infection control. Some of the categories covered in Management and Care are Advocacy, Client Rights, and Ethical practice. Various categories covered in Safety and Control include Accident Prevention, Hazardous Materials and the Use of Restraints. Be sure your NCLEX review books have a lot of practice questions for this section. Health Promotion and Maintenance represent 6-12 percent of the test. Some of the concepts covered in this section include the Aging Process, Disease Prevention, and High Risk Behaviors. Discipline yourself in your NCLEX exam preparation to review areas of the exam you dislike and are probably weak in. By doing that you’ll get the maximum amount of test score improvements output with the least amount of time input. The Psychology Integrity section accounts for 6-12 percent of the test. Your NCLEX exam review must include: Coping Mechanisms, Mental Health Concepts and Stress Management. The last section is Physiological Integrity. It’s the largest part of the exam and accounts for 38-62 percent of the questions. Be sure to cover these 4 sections in your NCLEX practice: Basic Care and Comfort, Pharmacological and Parenteral Therapies, Reduction of Risk Potential, and Physiological Adaptation. If you feel overwhelmed and frustrated, take a NCLEX review course online or a local prep class to sort out the overwhelming amount of medications you’re required to know. The NCLEX-RN is a pass/fail exam. NCSBN exam questions are tailored to each candidate’s competencies calculated in real time by computer during testing. The interactive computer adaptive system (CAT) selects the next question for the test taker based on the skill level demonstrated in previous answers and alternates between easy and difficult to establish an accurate range of professional competency. As you do NCLEX exam practice questions, keep in mind the length of the real exam is six hours and contains 265 questions. NCSBN test questions are offered in a multiple choice format with four possible answers. Some versions of the examination also include multiple responses, hot spots, fill-in-the-blank, drag and drop, and charts. Fifteen questions will not be scored as they are for statistical purposes. NCLEX-RN testing concludes when at least 75 questions have been answered and a minimum competency is demonstrated, at least 75 questions have been answered and a lack of competency is demonstrated, all 265 questions have been answered, or the six hours have passed. 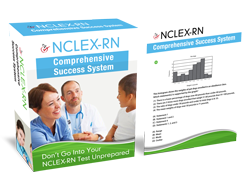 The best NCLEX RN exam practice means understanding how your test is scored. A numerical score is not provided. The test results will be available through the State Board of Nursing approximately 4 weeks after the test has been completed. If your nursing board participates in the Quick Results Service, unofficial results may be available within 48 hours. In the event of a fail, a diagnostic evaluation will be sent that will highlight problem areas. If you failed, then use to focus exactly where you need to spend your time in your NCLEX -RN exam study guide. Unfortunately, the pass rate on the first attempt is low as most candidates fail the first time. However, while paying continuous testing fees is expensive, it’s possible to retake the test after a 45-90 day waiting period. The best way a registered nurse candidate can reduce anxiety and worry in test taking is start reviewing for 2-3 months before the exam date. Overconfidence, procrastination and squandering limited preparation time are leading cause of testing failure. Choosing the best RN review books, practice exams and possibly a tutor (preferably a registered nurse who passed) can make all difference between pass or fail. If you’re not sure what are the best NCLEX-RN books then ask someone who already took the exam and passed or click on the links on this page for more prep help. You should create a test study plan starting at least 6-8 weeks before your exam date. If you have more time between now and your test date then leverage that to your advantage and begin preparing now without delay. This is the nursing career you’ve been dedicating your life and a small fortune in college tuition to achieve. You may very well need a few extra weeks of solid review time in order to pass. Schedule review time for the NCLEX exam at least 5 days per week and at least 1-2 hours each preparation session. It’s more productive if you take at least one day off each week to clear your mind and recharge your mental batteries. Review areas of NCLEX-RN test where you’re the weakest in the first 3 weeks. An investment of time in your weaker areas will often help boost your score two or three times faster than going over areas you’re more comfortable with. A candidate who can maintain focus and motivation during preparation for the NCLEX exam is more likely to succeed. Constantly visualize your ultimate goal of passing during your NCLEX-RN review. Create a peak performance mindset and program your mind for success. To do this continuously seeing yourself taking your test with confidence, competence and getting a passing score. Don’t think negative. Don’t doubt yourself and don’t dwell on the anxiety or you’ll end up conditioning your mind for failure. Visualize living your dream life helping others. See yourself achieving personal success in your own life with your registered nurse license. Feel how good it feels to be working to improve your life during your review for the NCLEX-RN exam. Be willing to pay the price of success and study. Use this to discipline you to study even when you don’t feel like it. See the bigger picture. Schedule blocks of uninterrupted time when reviewing for your NCLEX test date. The reason avoiding interruptions is so important is that once your concentration is broken, it can take you up to 30 minutes to get your brain warmed up again and get into the same flow of concentration you need for highly effective test prep. If you get interrupted often you’re productivity will be cut in half. It could take you twice as long to study in order to pass your registered nursing test. More over, you don’t want to risk not being prepared because your NCLEX review was subpar. Get the support of family and friends. Explain what you’re trying to accomplish and get them to work with you, not against you. Explain you can’t be disturbed during these schedule blocks of time and how important this to you. Ask them in advance for their support. Retrain yourself not to react to short-term urgencies of the moment like a ringing cellphone, a text message, checking your emails, Facebook or turning on the TV. Do this to avoid losing your limited NCLEX exam review time due to interruptions. Make your NCLEX-RN review easier and more productive. Turn off your phone and computer so you won’t be tempted with Facebook, phone calls, text messages, email alerts and anything else in your world that could drag your practice for the NCLEX to failure. Again force yourself to think long-term on your goal of getting a passing score and all the success you’ll have once your a registered nurse. Pharmacological and Parenteral Therapies is a subsection of the Physiological Integrity part of your NCLEX-RN® exam. The Pharmacological and Parenteral Therapies represent 15% of your test score. Therefore, be sure you allocate roughly this amount of your preparation to this area of the NCSBN® test. Here are some free NCLEX-RN exam practice questions for the Pharmacology and Parenteral Nutrition to help you prepare. 1.) Your patient has a new prescription for zolpidem, also known as Ambien. She should report which possible effect while taking this medication? 2.) Drug toxicity is a serious problem associated with which diagnosis? A. One nitro may be administered under the tongue. If chest pain continues, begin CPR. B. One nitro may be administered every 5 minutes, up to 3 total doses, or until chest pain subsides. C.	Vitals must be checked after administration since BP will rise. D.	Up to 3 nitro tablets may be administered sub lingual at the same time. Use the answers to these NCLEX preparation questions to improve your mastery of exam content. If daytime sleepiness is a problem, the physician should be consulted. The medication dose may need to be decreased, or is not being properly metabolized which could signal kidney or liver problems. A – Ambien induces sleep and does not discolor urine. B – This medication has no adverse effect on heart rate or regularity. C – Ambien has not been shown to cause headache. Drugs are carried out of the body via urine. In the case of renal failure, the kidneys do not filter. Therefore, medications can build up to toxic levels. B – Diverticulitis is an inflammation of the intestine that does not cause a buildup of medication in the body. C – Drug toxicity is not caused by pancreatic cancer; however, drugs and alcohol can contribute to the development of this cancer. D – Though many drugs can cause stomach ulcers, this condition does not cause drug toxicity. When a patient is having chest pain, one nitroglycerin tablet is placed under the tongue to dissolve. If the pain is not completely gone in 5 minutes, another may be given. Once 5 more minutes pass, if pain has not significantly subsided, another may be administered. A – This is not the protocol for sub lingual nitro use. CPR is never begun on a patient whose heart is beating. C – Vitals must be checked, but blood pressure is lowered by nitro. D – No more than one nitro tablet is given at a time. This is a powerful drug that can dangerously lower the blood pressure in a matter of minutes, slow the heart, and cause death. Pounds are changed to kilograms. (45/2.2=20.4kg or 20kg) There are 2mg per cc of medication. One cc per kg = 20 cc’s. One cc is equal to one ml. B – Poor calculation – you have overdosed the child. C – Calculation is off a small amount – but you are still headed for an incident report. D – Double dose – the damage done will depend on the medication. This procedure helps build pressure to keep air from entering the vein. B – Normal breathing will increase the risk of a dangerous amount of air entering the vein. C – This procedure will not produce the positive pressure needed to repel outside air. D – Turning the head is not necessary, though the patient may prefer it. Insulin is an acceptable additive for patients who need it with their TPN or PPN. No other additive or component is acceptable through the parenteral line. A –	Xanax cannot be given via a PN line, as it must pass through the digestive system. B –	Phenergan, and many other drugs, can cause precipitation in the TPN formulation. D – Demerol cannot be administered with TPN. A peg tube empties formula directly into the stomach to be digested. Parenteral nutrition bypasses the digestive system by administration to the bloodstream. A – A PICC line is inserted into a peripheral vein, but is long enough to empty into the large veins going directly into the heart. C – A subclavian line empties directly into the large vein of the heart, reducing risk of damage to smaller veins. D – A CVC also empties just above the heart muscle to be distributed. 8.) Correct answer C: Parenteral nutrition is formulated to be administered directly into the bloodstream of patients whose digestive system is non-functional. A – Parenteral nutrition goes directly into the bloodstream, bypassing the digestive system. B – Enteral nutrition cannot be given IV as it must go through the digestive system to be processed. D – Enteral nutrition is processed through the digestive system, usually through a tube that empties into the stomach. Want more NCLEX review questions, classes, books and prep courses to pass your NCLEX Pharmacological and Parenteral Therapies and other sections of your registered nurse test? Go to: How To Pass Your NCSBN Nursing Exam right now. To ensure public safety, entry level nursing candidates must meet set requirements established by the National Council Licensure Examination for Registered Nurses (NCLEX-RN). The requirements involve passing specific exams that demonstrate that the candidate has the necessary skills to perform their duties safely and effectively. The National Council of State Board of Nursing (NCSBN) develops and administers licensing exams throughout the fifty states, four territories, and the District of Columbia. Pearson VUE is the contracted exam provider, that also administers and provides test practice materials. NCLEX-RN practice test questions, an effective study guide and a review course will make the difference between pass and fail. High quality review materials ensure that all your hard work and long hours preparing isn’t in vain. A NCLEX-RN study guide is the medium from which hard work and long hours of preparation are translated into real exam competency and then a passing score. Just make sure your NCLEX-RN review course, books and practice tests closely follows the official NCSBN test plan. Before registering for the exam, you must register with the board of nursing and be declared eligible. The eligibility requirements vary from one state to another so check with your board. After you have submitted an application to the licensing board where you wish to work, register with Pearson VUE. Once the application has been approved you will receive an Authorization to Test (ATT) number from Pearson VUE. In order to book an exam time, you must have an Acknowledgement of Receipt of Registration from Pearson VUE, an eligibility letter from the board of nursing in your state, and an ATT from Pearson VUE. Test centers are available throughout the United States and are listed on the Pearson VUE website. Registration is available through the internet, telephone or by mail. If you register by internet or telephone you can pay using a credit or debit card (VISA, MasterCard or American Express). It is also possible to send in a money order, cashier or certified check by mailing the confirmation document along with the payment. Only money orders, cashier’s checks or certified checks will be accepted for mail in orders. The cost of the exam is $200. There may be additional licensure fees depending on the board with which you are affiliated. The exam is only offered in a computerized format. It is important to schedule the exam time as quickly as possible as there is limited seating, and places are assigned on a first come, first serve basis. Upon arrival at the test center, you will be asked for one piece of identification and a valid ATT. The only acceptable forms of identification at the test centers are U.S. driver’s license, U.S. state identification, passport, or U.S. Military Identification. It is best to arrive 30 minutes early for the exam. If you arrive more than 30 minutes late, you may not be allowed to take the exam, and you will not be reimbursed. The test contains 265 questions and allows six hours for completion. Nurse candidates must answer a minimum of 75 questions. The questions contain both multiple choice and written items in an alternating format. The differing formats include fill in the blank calculations, ordered response, and/or hot spots. Charts, tables, graphics, and video can be part of the question. The content of the test is intended to challenge nurse candidate’s knowledge and skills across the lifespan of a patient, in a variety of settings. The topics include Safe and Effective Care Environment, Health Promotion and Management, Psychosocial Integrity, and Psychological Integrity. The test also addresses the fundamental processes central to nursing such as Nursing Process, Caring, Communication and Documentation, and Teaching/Learning which are incorporated into all aspects of the exam. The exam uses a computer adaptive system (CAT) which means that depending on whether or not the previous response was correct or incorrect, the following question will be harder or easier respectively. This allows the test to establish an accurate range of expertise. The results of the exam will be available through the state nursing board. Some nursing boards participate in the Quick Results Service which means you can obtain unofficial results 48 hours after the exam. This option is also available with Pearson VUE for $7.95 on the NCLEX Candidate website. The official results will be mailed to you approximately one month after the exam. If you are successful you will receive a “pass” status. If you fail the test, you will receive a two page document called the Candidates Performance Report (CPR). The report will provide information on how many items were answered, and will indicate “below, near, or above passing standard” in various categories. Start the registration process today, and get licensed for a rewarding career. For a FREE RN exam prep report, go to: NCLEX RN Review right now.